If you have a return, call 800-238-0152 for a Return Authorization Number (RA) prior to return shipment. This number must accompany all returns. 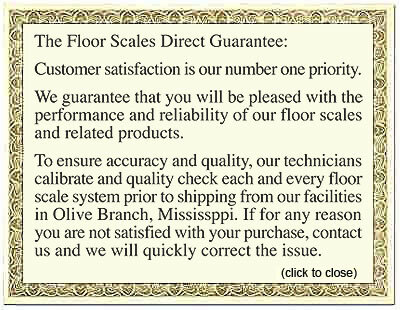 Most new, unused items sold by FloorScalesDirect.com (FSD) may be returned within 14 days of purchase for a credit or refund, freight prepaid, with prior return authorization approval from FSD. In the case of standard items these returns may be subject to a restocking fee of 25% if returned in the original packaging and in an unused condition. Non-standard items may be returned during the 14-day period but restocking fees may vary based on the nature of the item.